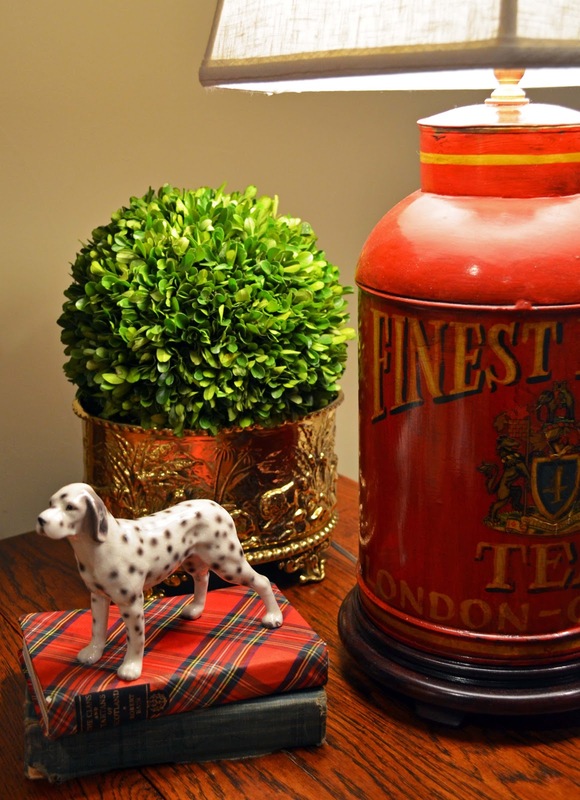 Today I'm joining Alison over at The Polohouse for her Favorites on the First linky party. This month we are talking lamps. This is an exciting subject for me because I have strong feelings for lamps…I love them. I'm just not sure how they would fit in with my ultra-traditional decor. I think that I might have to go back and buy it. What's that saying? "You can never be too rich, too thin, or have too many lamps." Quite a lamp collection! 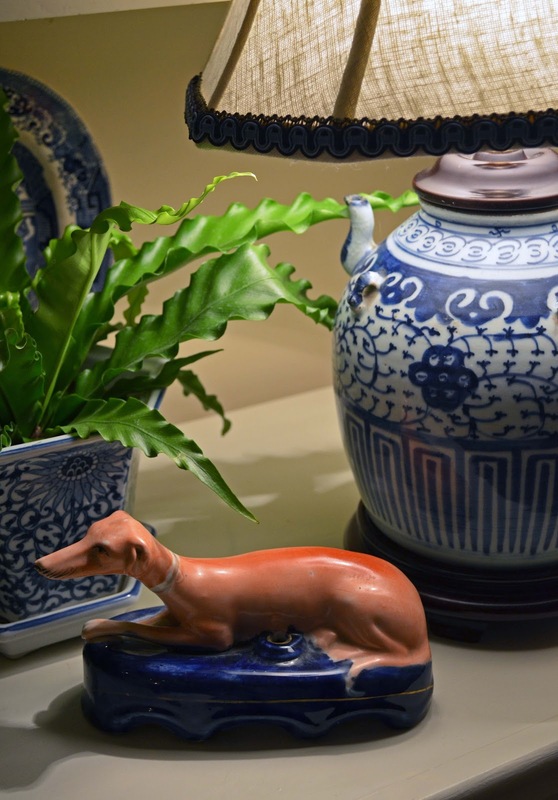 I love the Imari one and all the dogs. And the blue and white! 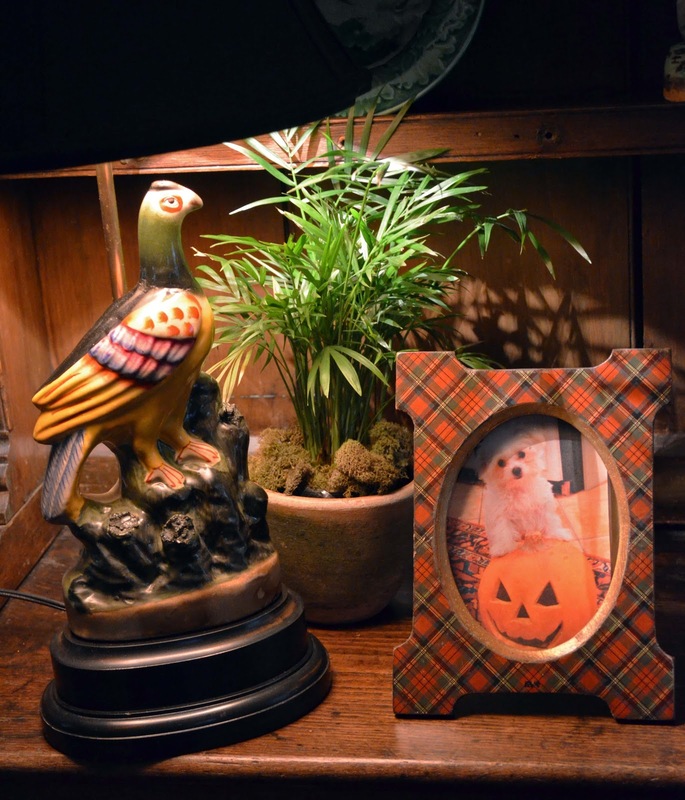 I love keeping my eye out for lamps at antique stores. You can find some treasures. 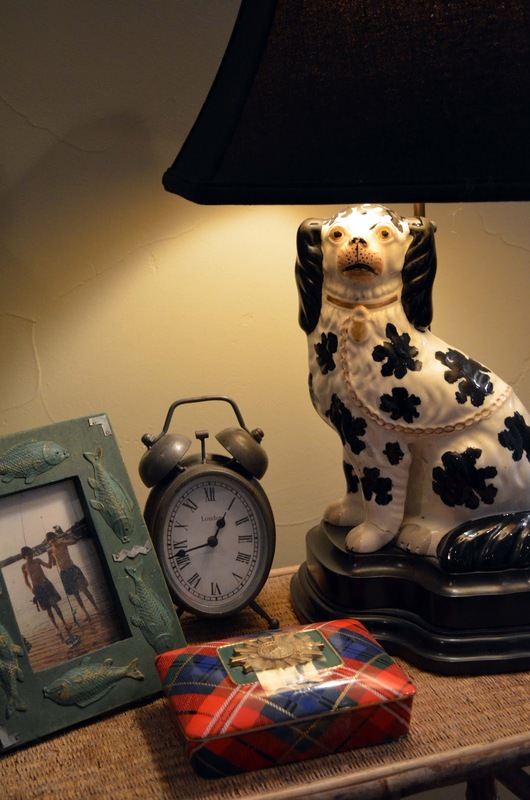 Yes, antique stores and estate sales are great sources for one-of-a-kind lamps. Thanks for the comment, Keri! You have a great collection of lamps. 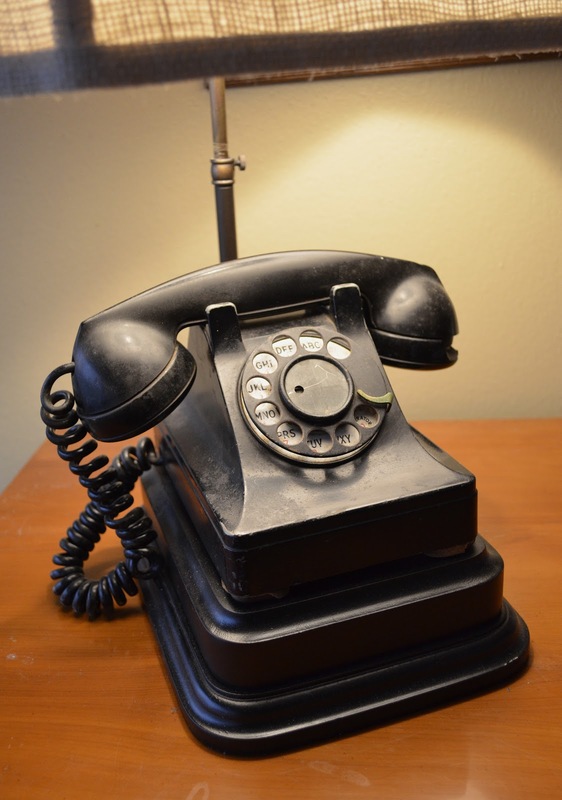 I do like the telephone one too. I feel like I should have included you in the recent post that I showed the similarities of collections with Waveney! You are the missing middle sister, I think! Awesome collection and I am super impressed with whomever it is that is making your lamp bases. They are so well done and such perfect shapes to follow the footprint of the pieces you have converted. Amazing! 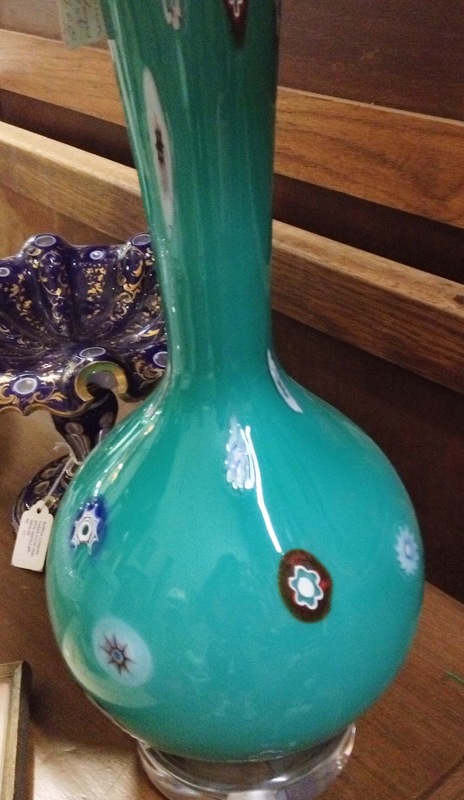 Did you paint the base on the one Staffordshire piece to resemble the scarf of shawl? Perfection! 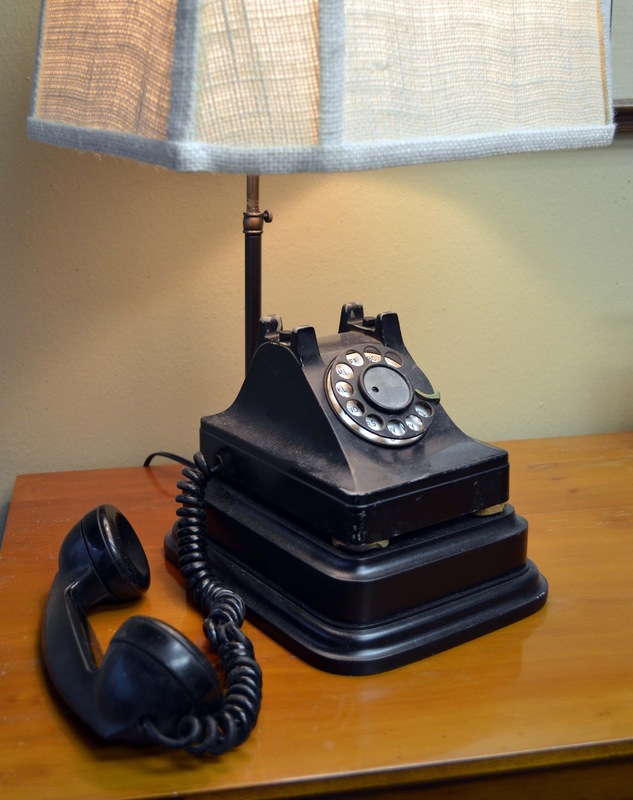 And Please tell Mr. TT I love how he styled his phone lamp. Remember him styling tha back of you car for the tartan parade too! 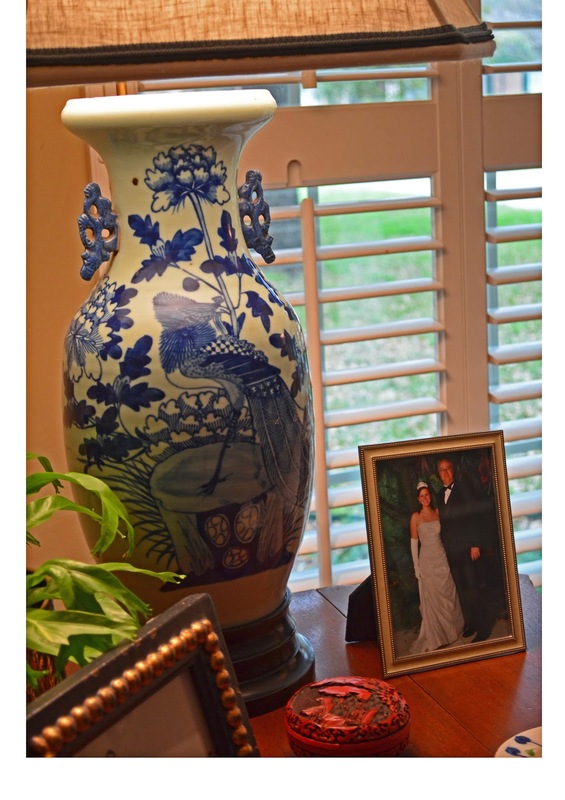 Tell him the blogging gals love that -- when a hubbie gets involved in the linky party stagings! 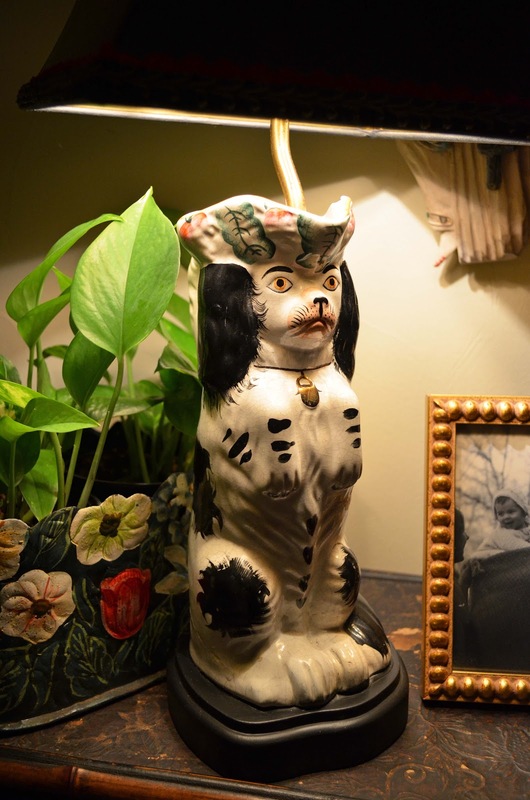 Have a great week, and yes, go get that dog lamp too, ok? Alison - Thank you for the sweet comments. I would love to be your middle sister! 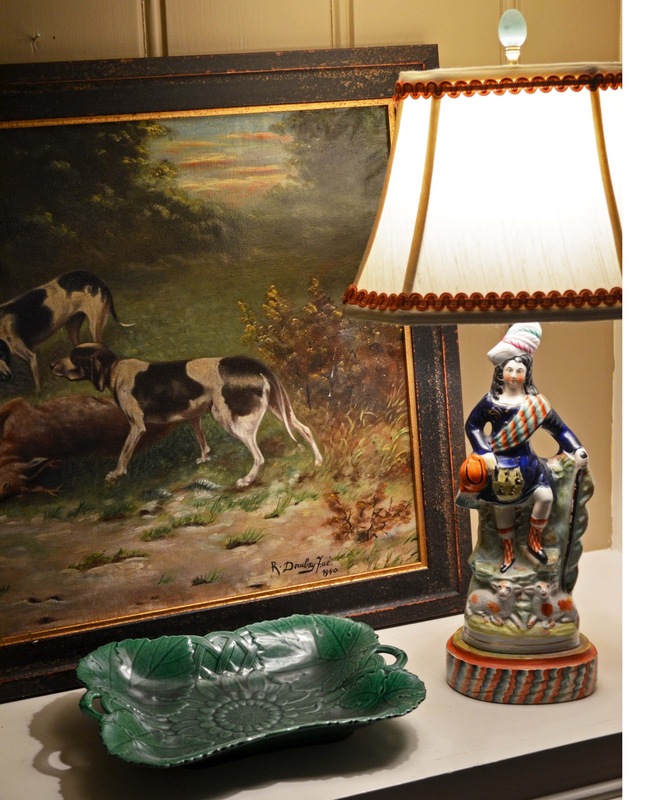 When I took the "Dandy" Staffordshire figurine to be made into a lamp, the lamp people painted the base to match the shawl motif. It's one of my favorites. Mr. TT enjoys helping me style some of my posts. For being a banker-type, he's pretty creative. 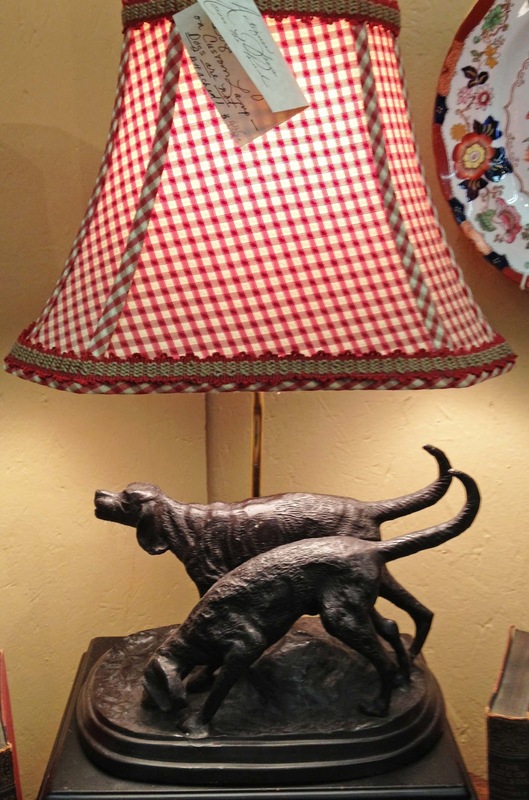 I did go back to the antique mall and bought the bronze dog lamp. I'm sure you'll see it showing up in a post soon. Looking forward to your May linky party. Favorite flowers will be fun! Incredible collection - love them all! I agree, you need to go get the dog lamp. Or tell me where it is, and I'll go get it! Thanks! I did go back and buy the lamp. Now I need to buy a new shade. I love the red-checked shade it came with but need more light. It's always something! I adore your lamp collection and agree you can never have enough!!! I vote yes on the pretty blue ones! Came by to stalk your tartan lovelies and you are not around! Hope all is well. Will go over and drool at your boards on Pinterest instead I guess? 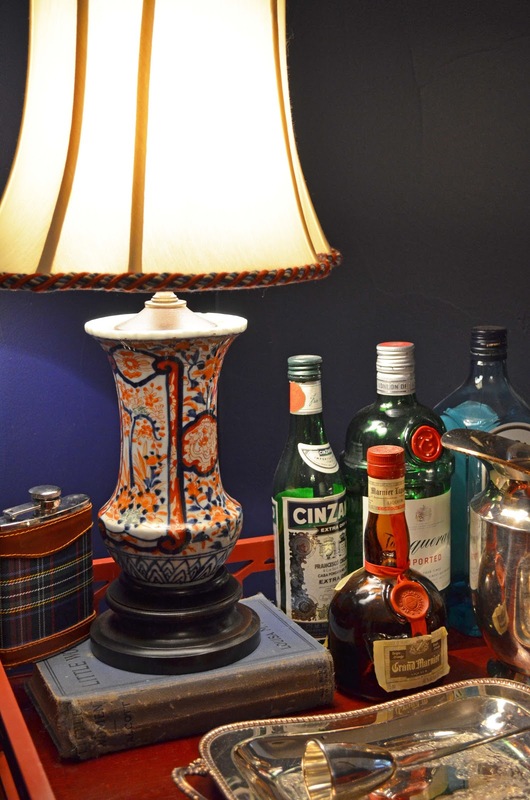 No, you can never have too many lamps, and you have a fabulous collection. I can't believe I missed this post when you shared it last month. Sorry for the late visit. 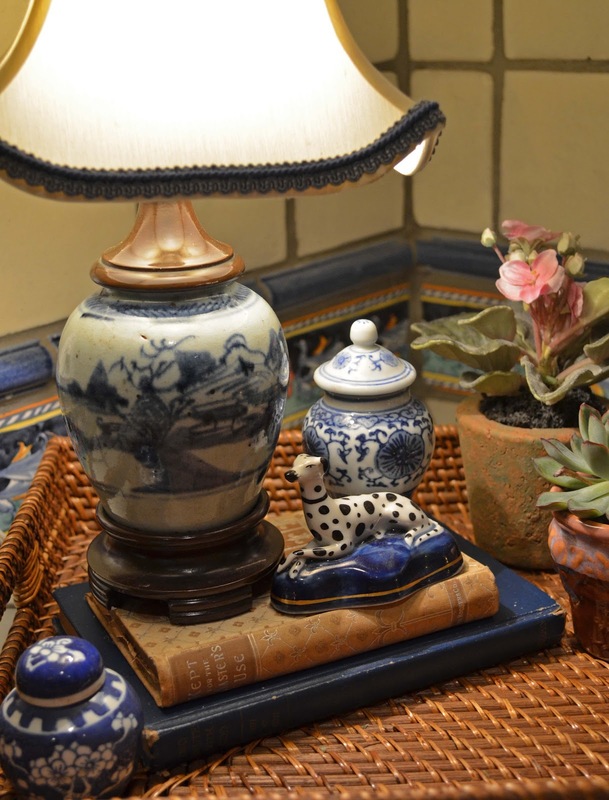 Love the black and white check shades, the Staffordshire lamps, and of course all the blue and white. Well, there isn't a lamp here I don't adore! Love, love, love your style, Kathy! Just found you due to our SWEET bloggin' friend Alison!!! Love your style and I too love lamps...yes, I'm drooling over all of yours! So glad you went back and got that lamp! 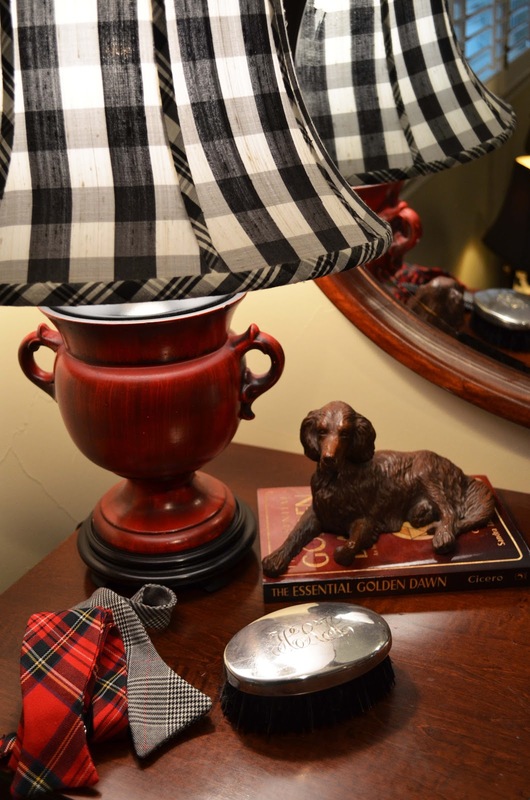 When you find a new shade, sell me the red checked shade, it would go perfect in my home and I have a few lamps needing shades!!! I adore yours. And the base on the Scottish man is really amazing. 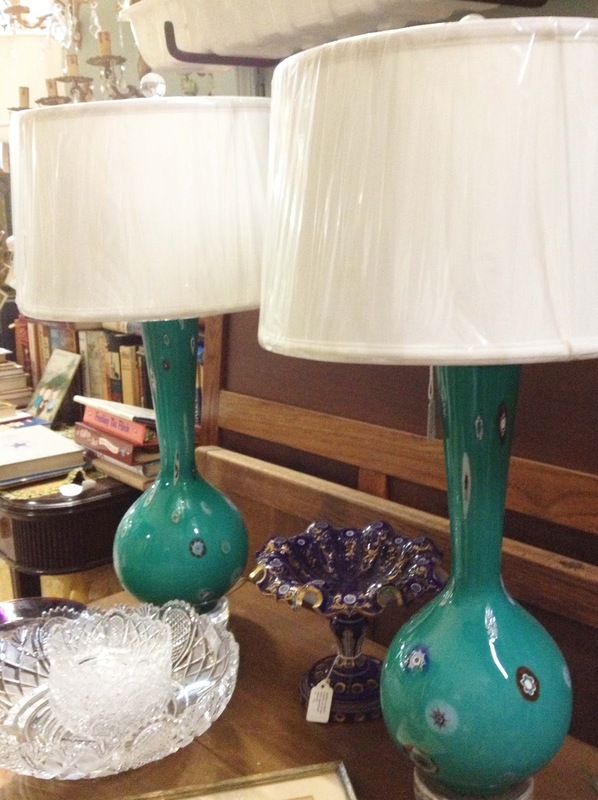 Your lamp collection is fabulous- so many special ones! I am like that about pillows - I have a closet jammed full(LOL). Very useful post. This is my first time i visit here. I found so many interesting Click the Following Post stuff in your blog especially its discussion. Really its great article. Keep it up.